The Qualifying Body with formal responsibility for submitting a proposal to Cornwall Council to initiate the process of preparing a Neighbourhood Plan. Submitting the draft Neighbourhood Plan to Cornwall Council, together with a summary of the proposals. Agreeing with Cornwall Council on the appointment of an Independent Examiner. To ensure the neighbourhood planning process is properly organised and accountable. When the group is not in session, the Chairman will act as head of Porthleven Neighbourhood Plan, its representative to the outside world and its spokesperson. 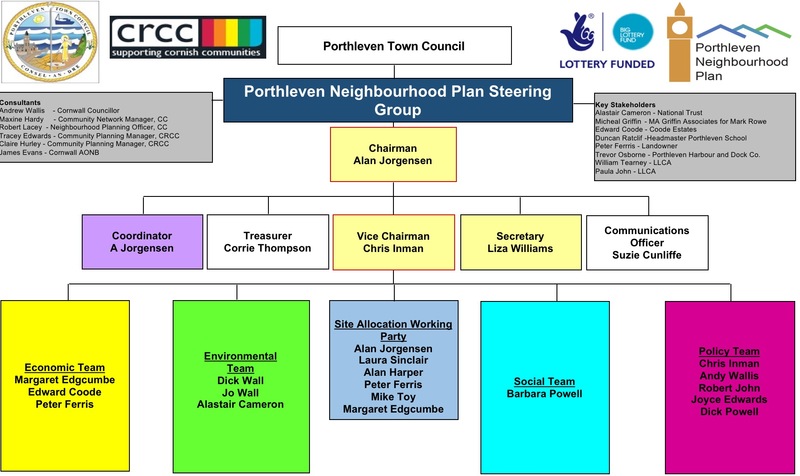 To be elected or appointed by the members of the Porthleven Neighbourhood Plan Steering Group. Deputy to the chairman, chosen to assist the chairman and to serve as chairman in the absence of the chairman, or when a motion involving the chairman is being discussed. To ensure the neighbourhood planning process is properly organised. To make records of the meetings, decisions that are made and actions to be taken. To arrange and organise meetings and venues. To include duties related to correspondence such as the typing out of letters, preparing meeting documents for review and maintaining filing systems. To ensure the neighbourhood planning process is properly organised and to act as Secretary when required. Responsible for managing the process of developing and delivering the plan. To act as the main point of contact for the Porthleven Neighbourhood Plan Forum. To ensure the neighbourhood planning process is properly organised. To keep a track of any money that is received and spent to make sure that the finances are in order and give confidence that money is not being wasted or misspent. To determine the land and infrastructure necessary to create jobs and contribute to a vibrant economy. To contribute to the development and delivery of the plan through planning, community engagement, consultation and funding. To protect and enhance the natural, built and historic environment and to ensure that future generations can benefit from the same, or better, quality of environment as enjoyed by the current generation. To contribute to the development and delivery of the plan through planning, community engagement, consultation and funding. To ensure the housing, services and facilities are in place to meet the present and future needs of the community. To contribute to the development and delivery of the plan through planning, community engagement, consultation and funding. To bring together the recommendations of the Task Groups and start to develop policies. To contribute to the development and delivery of the plan through planning, community engagement, consultation and funding.